The last major Bible Dictionary published by a Catholic for an English-speaking Catholic audience was probably done by John L. McKenzie S.J. back in 1965. (If there are others out there, I would be happy to be proven wrong on this.) That old edition is still in print today, and I regularly see it not only at Catholic bookstores, but occasionally at places like Barnes and Noble and Borders. One wonders whether the popularity of McKenzie's work was due to its usefulness or the simple fact that it was the only volume available developed by a Catholic. My guess is that the truth lies somewhere in the middle. But, alas, there is finally a new Catholic Bible dictionary on the market. Thanks to the work of Catholic Biblical Scholar and convert, Scott Hahn, a new and updated Bible study tool is available for use. 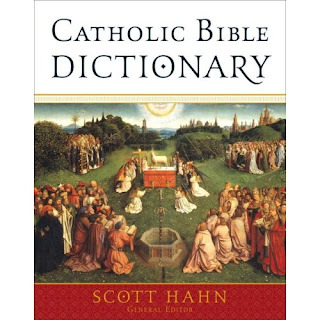 Published by Doubleday, the Catholic Bible Dictionary will prove to be a wonderful gift to many Catholics who are looking for a one-volume Catholic Bible dictionary. While smaller and less technical than the massive Anchor Bible Dictionary, this new edition I would place somewhere between the more comprehensive HarperCollins Bible Dictionary and the McKenzie edition in regards to sheer size and amount of material included. While it is difficult to evaluate any work of this nature in just one sitting, it is clear that the fact that such a volume now has been published is a very good thing. From what I have read so far, I think this dictionary could be used with the RSV, NRSV or NAB. Ultimately, time will tell as to whether it will be useful or not. I tend to think it will be, not only because it is published by a major publishing house and written by a Catholic Biblical scholar that I trust, but more importantly it incorporates recent Biblical scholarship and archaeological finds. I hope to blog more about it as I begin to use it more over the next few months. What I can say is that if you are Catholic and need a good, basic one volume Catholic Bible dictionary, this one is for you.
" I, Paul, am already being poured out like a libation,and the time of my departure is at hand.I have competed well; I have finished the race;I have kept the faith.From now on the crown of righteousness awaits me,which the Lord, the just judge,will award to me on that day, and not only to me,but to all who have longed for his appearance. In connection with this solemnity of Saints Peter and Paul, my archbishop, Allen Vigneron, received the pallium from Pope Benedict XVI today. He has been blogging about his experiences here. His entries, along with those who have been travelling with him, have been pretty interesting, so check it out. As many of you know, I feel that the way in which a particular Bible translation is presented is almost as important as the quality of the translation itself. A particular translation may be the greatest thing since sliced bread, but if it is presented in an unreadable, unhelpful way, who will bother reading from it on a regular basis? For me, the page layout is always an important issue I look at before I purchase any Bible. The first question I always ask, while I am flipping through a Bible, is: "Do I actually want to read from this?" There are of course many issues that go along with that question. What is the typesetting? How are the study tools, like cross references and notes, organized? Ultimately, is what I am holding in my hand pleasing to the eyes? So, what Catholic Bibles out there do you like to read from? Most of us are aware that the NAB comes in a pretty standard page format. The NJB is one of the few that is done in a single-column. What about the RSV or NRSV? The Catholic Comparative New Testament, edited by Jean Marie Hiesberger and published by Oxford University Press, should be a standard Bible study tool that all Catholics own and use. While there have been other parallel Bibles published recently that included Catholic translations, like The Complete Parallel Bible with the Apocryphal/Deuterocanonical Books or The Precise Parallel New Testament, this remains one of the only ones still in print. The Catholic Comparative New Testament provides the reader with eight different Catholic, or Catholic approved, translations. The list includes the Douay-Rheims, RSV-CE, NAB, NRSV, Jerusalem Bible, NJB, Good News Bible, and Christian Community Bible. The translations are organized according to where they fit on the formal equivalence/dynamic equivalence spectrum. Thus, when you open up the book, the left page contains the DR, RSV-CE, NAB, and NRSV, while the right page has the JB, NJB, GN, and CCB. Also included are the original translators preface/foreword to each particular translation. I periodically like to compare the various translation philosophies for the different translations, so, at least for me, its nice to have them all compiled into one book. The Catholic Comparative New Testament includes a short introduction by Hiesberger, which briefly covers topics ranging from the differences in translation philosophy to the ways of bringing the Scriptures into one's daily life. One of the best features of this parallel Bible is the design and typesetting. The type resembles the typical Oxford University Press style that one sees used in many Oxford NRSV editions. I find the overall layout of each page to be pretty good for a parallel Bible. While any such Bible edition of this design is going to be forced to use smaller text size to fit all eight translations, I think Oxford does an admirable job. This edition also succeeds in that it is not a massive book which takes up half of your backpack. While not compact, it is 9.1 x 6.3 x 1.8 inches, which makes it very portable. 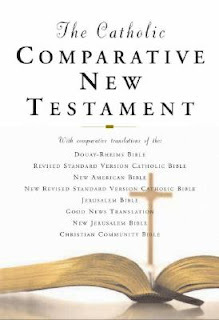 Overall, The Catholic Comparative New Testament is a fine study tool for Catholics. If I had one minor complaint, it would be that I would rather have the latest Greek text and the Nova Vulgata included. Although having said that, I am not sure which two translations I would have liked to have seen removed. My guess would probably be the Good News and Christian Community Bible, which I rarely see any Catholic American reading. You and your readers may be interested to know that christianaudio.com is having their semi-annual audio download sale through July 3rd. The NRSV New Testament (and most other titles) are available for $7.49. Although christianaudio.com seems geared toward a predominantly Protestant audience, there are a number of titles of interest to Catholics as well, including Richard John Neuhaus, GK Chesterton, and others. The continued publication by HarperOne of different editions of the NRSV continues. 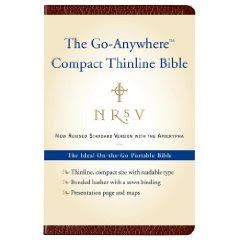 Coming September 1, they will publish The Go-Anywhere Compact Thinline Bible. So far as I can see, it will come in two edition, with or without the Apocrypha. At this point, I have yet to see a Catholic edition. The size of this compact thinline NRSV is going to be 6.2 x 4 x 1.1 inches. It will come in bonded leather, with sewn binding. Maps and the always essential "presentation page" will be included as well. I wonder if this will replace the original Go-Anywhere NRSV that was published back in 2007? August 1990: at the Business Session of the 1990 meeting of the CBA, the membership passed a resolution urging the leadership to take steps toward initiating the revision of the New American Bible Old Testament (except the Psalter, which had already being revised) (see minutes of the meeting CBQ 52  703). July 1993: Based on the resolution passed in 1990, the CBA Executive Secretary requested that the CBA’s NAB Board of Control take the necessary steps to initiate this revision process. April 1994: With the agreement of the Administrative Board of the National Council of Catholic Bishops to proceed with the revision, a new Steering Committee/Editorial Board (whose members were suggested by the Board of Control) was established. It eventually consisted of Deirdre A. Dempsey, Robert A. Di Vito, Joseph Jensen, O.S.B. (chair), Dale Launderville, Roland E. Murphy, O.Carm., Kathleen Nash, Irene Nowell, O.S.B., and James P. Walsh, S.J. This first meeting was to establish guidelines for the revision and to arrange for thirty-eight CBA members, chosen for their specialization in the Old Testament books they would revise, to begin work. Late 1994 through May 2002: Revised texts began to be received before the end of 1994, and the committee began meeting one whole weekend every month going over the texts received to improve and complete the revision process. May 2002: The completed revision of the Old Testament text was sent to the CCD office of the USCCB. This was then transmitted to the Bishops Ad Hoc Committee for Scripture Translations Proposed for the Liturgy, chaired by Bishop Arthur Serratelli. This committee sent the texts to individual "censors," whose job it was to assure that the revision would be suitable as a Catholic translation. They returned their findings to the Ad Hoc Committee. The Ad Hoc Committee reviewed the work of the censors and then sent the texts back to the revision committee with any suggestions from the censors for changes. June 2005 through September 2008: These texts began to be received from the Ad Hoc Committee. These were then reviewed by the revision committee and responses to suggestions returned to the Ad Hoc Committee. September 2008: The last book (Jeremiah) was received from the Ad Hoc Committee, which the revision committee (necessarily) dealt with very promptly (in view of CCD plans to present the completed revision to the USCCB for approval at their November meeting). Concomitantly, the CBA was attempting a revision of the NAB Psalter of 1991 to a form that would be acceptable for the liturgy; this meant conforming it to the requirements of Liturgiam authenticam. In June 2003 a revision of the NAB Psalter, revised in this manner, was sent to Bishop Serratelli's Ad Hoc Committee with the hope it would be used in the liturgy. 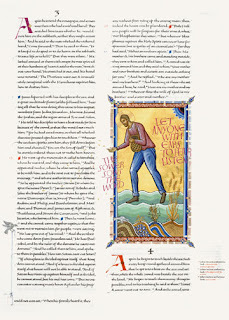 In March 2006 Bishop Donald Trautman, then Chair of the Bishops Committee on the Liturgy, invited a presentation of this revised Psalter, which presentation would be to demonstrate its conformity to Liturgiam authenticam and its "singability" (the latter demonstrated with the help of a CD which included pieces by St. Anselm's Abbey schola, the Benedictine Sisters of Sacred Heart Monastery, Cullman, AL, Jean Olexy, Normand Gouin, and the Oregon Catholic Press Singers). Bishop Trautman sent letters of thanks to all those involved individually in its production, but the Ad Hoc Committee had not reported on the vetting process so no action was taken. May 2008: The Ad Hoc Committee finished the vetting process and sent suggestions for the re-revised Psalter. So, what does this all mean. 1) The revised NAB OT is complete and it has also been approved for eventual publication with the revised NAB NT. Good! 2) There will be a re-revised NAB Psalms! Even though the USCCB decided to go with the revised Grail Psalms for Mass, the CBA will only publish the revised OT once the re-revised NAB Psalms are finished. Anyone who has read this blog knows how I really dislike the revised '91 NAB Psalms. I love reading the Psalms, so my use of the NAB has been very limited due to the poor translation, most notably the use of vertical inclusive language. Wow! I am actually excited! This revision certainly can't be worse than the '91 Psalms. There is a God! :) Very good! 3) All revisions are in "conformity" with the Vatican document Liturgiam Authenticam. Of course, this could be interpreted in many ways, and we will just have to see the results whenever the fully revised NAB is published. Hopefully good! Ultimately, if the revised NAB OT and re-revised Psalms follows the translation philosophy of the revised NAB NT, in reasonable conformity with Liturgiam Authenticam, then I would seriously consider using the NAB full-time. I have never really had a problem with the revised NAB NT, which I think does some things quite well. 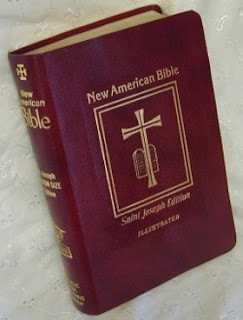 And while there will always be those who dislike the NAB, for various reasons, I think it would be a wonderful gift to the many Catholic Americans who deserve and desperately need a solid Church sponsored modern translation of the Bible. St. Jerome Pray for us! I wonder why Hendrickson Publishers decided to take on this project? From browsing their website, it doesn't seem that they produce any book version of the NAB or any other specifically Catholic Bible edition. Whatever their reasons, it is good to see the NAB get some publicity outside of the standard NAB publishers that, IMHO, don't do a very good job. Now you can profit from hearing God’s Word wherever you are, whether it’s in the car, at the gym, around the house or simply while relaxing. Let the power of the Scriptures refresh your soul and encourage you in daily life when you listen to the New American Bible translation. This recording, which is carefully read word-for-word by masterful narrator Stephen Johnston, features the entire NAB without background music. • Enjoy hearing the Bible while on the go, at home, in personal devotions or group Bible study. • The New American Bible is the standard translation authorized for use in the Catholic Church in the United States. It is the first edition of the Catholic Scriptures in American English to have been translated from the original languages. • This edition has been digitally mastered for enhanced listening enjoyment. • Sturdy CD wallet provides easy portability while protecting the discs. Caller: I have been trying to study the Bible, and I recently bought Scott Hahn's [and Curtis Mitch's] study of Matthew. I understand they are preparing a study for every book of the Bible. Is that the best source for studying the Bible, or is there another study Bible I can use until it is finished? Brumley: In the Fall, we're planning to publish the New Testament together in a single volume. We are going to be cranking out the Old Testaments volumes as fast as we can -- faster than the New Testament volumes (or else it might take forever). 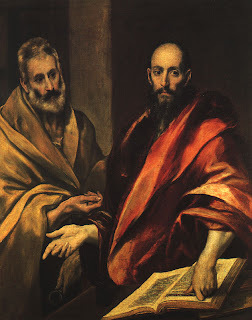 There are other Catholic study bibles, but I think that the Ignatius Catholic Study Bible with Scott Hahn and Curtis Mitch is the best out there. I encourage people to use the booklets for personal or parish Bible studies. The reason why I think they're good is that they use a good translation (the Revised Standard Version, Second Catholic Edition -- not just the RSV, not just the RSV-CE, but the Second Catholic Edition.) On top of that they have great annotations (done by Scott Hahn and Curtis Mitch) that look both at the historical context of the texts and also the teachings of the Church Fathers and some great commentators from the early centuries of the Church. You get both something solid from a historical point of view and also a fuller, deeper spiritual tradition of understanding the Bible. So that's what I would recommend. 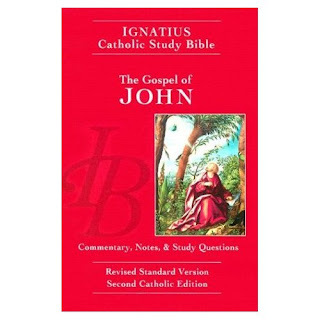 There are other [Catholic] study Bibles out there, but I don't think any of them have the fullness of what we have in the in the Ignatius Catholic Study Bible booklets. If you want to listen to the the entire show, which includes the caller's question 4 minutes and 30 seconds into the interview, go to the April 2 Q&A show with Mark Brumley. I think it is great news that they are going to start publishing these editions at a much faster rate. I have complained about the slowness of publication for the past few years. It is nice to see that Mr. Brumley realizes that at the current pace "it might take forever" to complete the project. Yes, or perhaps by 2025 at the earliest. I certainly intend to get the full New Testament edition in the Fall. It will be interesting to see if they keep the same page format, including the study questions, for the New Testament edition. I would assume that all of the resources that are included in the individual volumes would be in the full New Testament edition. Mr. Brumley mentions that there are other Catholic study Bibles out there. While that is true, the selection is considerably limited. If you are looking for a specifically Catholic, one volume study Bible, then you can choose between the two Oxford Catholic study editions, The Catholic Study Bible and Catholic Bible: Personal Study Edition, and the New Jerusalem Bible. Of course the main difference between the two Oxford editions is the introductory material, since the study notes and book introductions are the same for any Bible that uses the NAB. In many ways, I find the NJB edition to be superior to the Oxford ones, but that's just me. The completion of the ICSB is ultimately a good thing, since it will provide Catholics more study Bible options. If the quality is good, as well as the sales, perhaps future Catholic study Bible editions could be published. Hmm.....maybe the fine folks at HarperCollins/Harper One/Harper Catholic Bibles would consider an NRSV Catholic study Bible? 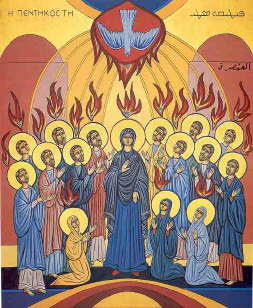 Happy Pentecost to you all!